Hamlet's way of employing imagery is to be identified as a unique artistic process. when he begins to speak, the images fairly stream to him with the slightest effort as immediate and spontaneous visions. They show us that whenever he thinks and speaks, he's at the same time a seer, for whom the living things of the world about him embody and symbolize thought. seem to me all the uses of this world ..."
This world, in which he finds himself and towards which his attitude is defined, is expressed in terms of a most striking, central image of sickness, the "unweeded garden", that will permeate the whole play. The "unweeded garden" evokes an atmosphere of corruption, decay and unfaithfulness in an indirect, general way. Hamlet, in fact, is capable of transforming this awareness into symbols and then interpreting those symbols. The "unweeded garden", already established as symbol of the corrupted world, Hamlet's garden goes on to explain it: "things rank and gross in nature" until they "possess it merely." Then there is a shift from the general to the particular: his family situation. This shift is revealed through a dramatic process in which we witness a succession of flashes produced by a comprehensive alert mind. There is a shift to the moral shock which has resulted from the sudden disclosure of Hamlet's true nature. all his life he had believed in her. He had seen her not merely devoted to his father, but also hanging on him, "as if increase of appetite had grown by what it fed on." 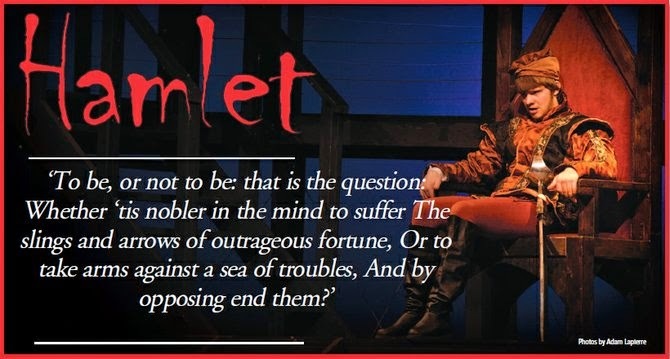 This cluster of imagery reveals the spontaneity and acuteness of Hamlet's mind it has the power of observation, the capability of scanning reality, and of penetrating the veil of semblance to the very core of things. is characterized by vividness with which the process of poisoning and the malicious spreading of the disease is portrayed, "... and curd like eager dropping into milk. "The corruption of land and people throughout Denmark is evaluated by Hamlet as an irresistible process of poisoning. Finally, this motif reappears in the poisoning of all the major characters in the last act. Corruption, as represented through the poisonous motif, reveals Hamlet's power of transforming reality into imagery by his full awareness of the human nature and of the world around him. The first appearance of the ghost, creating a sense of confusion for both Marcellus and Bernardo, introduces the notion of uncertainty to the play--the third and vital aspect of the human condition,"Horatio says 'tis our fantasy", until reality defeats uncertainty,"is not something more than fantasy". Let me not think on't Frailty, thy name is woman ..."
This fragmentation reflects the fragmentation of his mental process. Here the style is reflecting the dilemma of his mind; it has been invaded by "frailty", a disturbing element from the human condition. Such fragments evoke not only his mental state but also his psychological conditioning, characterized as they are with bitterness and agony: "... like Niobe, all tears-why she, even she ..."
Hamlet doesn't have the active will to take revenge, so his mission seems to spring more from without than from within. In other words he seems to be more persuaded by the ghost than by his own conscience. Realizing that "conscience does make cowards of us all", Hamlet experiences deactivation of will. "... and lose the name of action", seems to be the proper description of the will's failure to assert itself. Corruption, cruelty and uncertainty--three aspects of the human condition--are revealed genuinely through keen observations of reality embellished by various clusters of imagery, most prominent among which is poison imagery-animal and plant imagery being less effective in evoking the proper atmosphere of the human condition. Through their concreteness and preciseness, their simplicity and familiarity, Hamlet's nature is introduced with all its aspects: corruption and integrity, cruelty and mercy, uncertainty and assertion. We see a man, who in other circumstances might have exercised all the moral and social virtues, placed in a situation in which even the amiable qualities of his mind serve but to aggravate his distress and to perplex his conduct.